Renowned among music connoisseurs for his skills as a superb vocalist, musician, writer, arranger, producer, Chris Rouse is poised to take his rightful ‘spot on the floor’ in the international solo arena. Currently crafting his debut CD, the end product will showcase Rouse’s signature brand of pop/soul. A fusion of organic new school with old school nuances. Chris, is so much more than a soul singer. He truly is an artist for the new century. Chris personifies the unique fusion of cultures and sound that distinguishes the modern music scene. 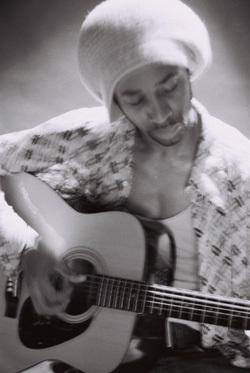 His music is multidimensional reflecting his varied influences in rock, funk, soul and pop. From the sensually hauntingballad Soul Beautiful to the seriously ‘funking’ Magic, his music is rich in tone and harmonic color with a mastery of vocal arrangements few artists in today’s world can match. “ The bottom line,” says Chris. “is that I just want to make great music. To celebrate all music…to bring out the ‘soul’ in all music, pop, rock and whatever. Not to sound contrived, but I feel music is about oneness and I want to push the creative boundaries of ‘soul’ and pop music.“. With many a musical turn comes a new phrase, ‘Hip Hop’, ‘Trip Hop’, ‘Neo-Soul’, whatever. The next wave? “Rouse-Soul”, and with it, it’s originator Chris Rouse. Certainly an artist to watch for now and into the future. Chris's debut EP out soon...stand by!